Important Note: Important Note: This tennis break is tailored to a minimum of level 4 up to level 9, on our self assessment guide and unfortunately not suited to beginners or players new to the game. 2 night residential option: Half board and tennis programme. 1 night residential option : Half board and tennis programme. 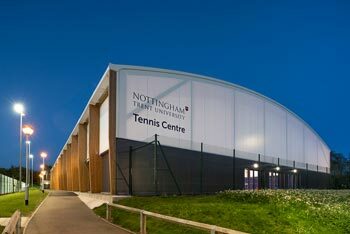 The Nottingham Tennis Centre is the largest in Great Britain and one of the biggest in Europe. It hosts the Nature Valley Classic Nottingham men’s ATP World Tour and women’s WTA International events, where some of the world's best players make their preparations for Wimbledon. University Boulevard, Nottingham, Nottinghamshire, NG7 2QH - google maps offers the best directions. Copyright © 2007 nickringleisure.co.uk All rights reserved.